When I spoke to a cousin of mine about Cliff Whiting’s recent passing, she talked about the first work of his she had ever seen. It was a work that she saw as a child while on holiday with her family on the East Coast. The work was the phenomenal Cape Runaway mural in the whare tipuna and dining hall of Kauaetangohia Marae that Cliff created with fellow Te Whanau-a-Apanui artist Paratene Matchitt. Undertaken in late 1973 and early 1974, the two artists were given free rein by the local rangatira, Manihera Waititi, to add whatever they wanted to the Marae they both belonged to. The freedom given was rare Cliff said, with the opportunity seen by Waititi, who had attended the first Maori writers and artists hui in Te Kaha, as a chance to create something new and avant guarde and to create a unique identity for Kauaetangohia. I have only seen the mural in reproduction, but have chosen to focus on it in this small piece of the writing because the images I have seen express the dynamism, vision and power of both Cliff and Para’s work and perhaps carried throughout their respective careers. They show their individual, and what became their signature styles, and the extraordinary mix of imagery and visual languages including kowhaiwhai, tukutuku, ta moko, whakairo and figurative forms, and design, that they were abstracting and exploring. Māori art historian Rangihiroa Panoho describes the mural as ‘revolutionary in a First Nations community context’ and as a ‘pou herehere’, an important marker in Māori art history. Panoho believed the mural to be a seminal moment in the bringing together of Māori and New Zealand art ideas and forms and one that expressed ‘the polemic between the Marae and the contemporary’; the idea, in some schools of thought, that the two worked in opposition to one another. Cliff, I don’t think, believed that the contemporary and the Marae were opposite. He made our Marae central to his work and practice from the restoration work he undertook, to his work as a member of the Māori Advisory Board for the Historic Places Trust, to the creation of innovative meeting house forms and design. As well as being contemporary and ‘revolutionary’, his meeting house work included whakapapa stories or ‘ancestral retracings’ as Rangi Panoho called them and ‘community rejuvenation’. Cliff spent a lot of time working with and empowering Maori communities through art. My Otakou whanauka, after Cliff’s passing, remembered the work they did with him to create a Pou at Taiaroa Head. Takahanga Marae in Kaikoura, Te Rau Aroha Marae in Bluff and Te Hono ki Hawaiki at Te Papa are three other examples of that work, as is his work in Kauaetangohia Marae twenty or so years earlier. Cliff’s career extended over almost six decades. He was one of the pioneers of contemporary Māori art and one of a small group of Māori artists including Ralph Hotere, Katarina Mataira, Cath Brown, Marilynn Webb, Fred Graham, Muru Walters, Para Matchitt, and Sandy Adsett who broke ground for all of us. He, like the others in that group, trained as a Māori art specialist and was mentored by artist and visionary art educator Gordon Tovey and Tohunga whakairo Pineamine Taiapa. 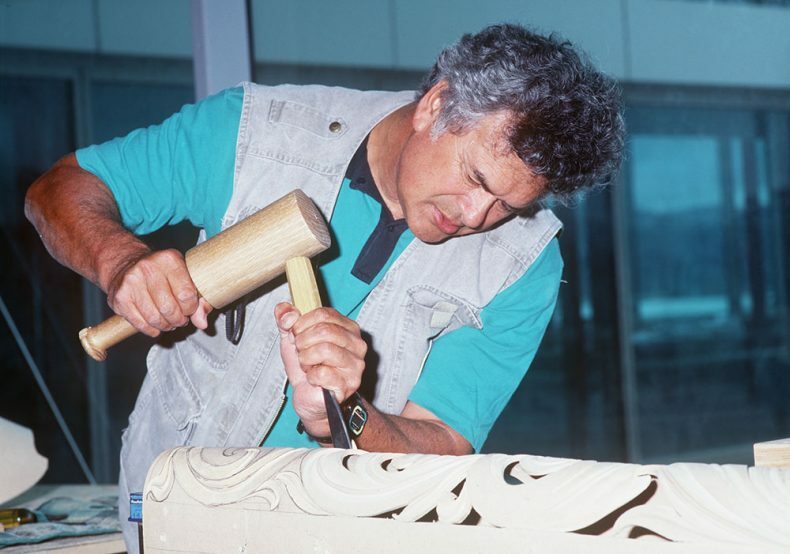 Cliff worked as a Māori arts and crafts specialist for the Department of Education for 15 years. Another important mentor for Cliff, earlier in his career and who he boarded with in Wellington so he could attend Teachers Training College, was New Zealand artist Mervyn Taylor. Cliff met Mervyn while he was still at high school in Te Kaha. Mervyn travelled to and lived in Te Kaha for a short period, supported by an award he had won. His time in Te Kaha was focused on research for a series of prints, based on Maori legends, that he wanted to create. I think Mervyn’s stylistic influence can be clearly seen in many of Cliff’s drawings and in his mural work at Kauaetangohia Marae. Other significant roles Cliff held include being a founding member and a chair of the Māori and Pacific Arts Council known now as Te Waka Toi. This small piece of writing is an acknowledgment of Cliff, his life, his work and his influence in the field of Māori art and as the first Kaihautu of Te Papa. We are saddened by his loss. Me te aroha tino nui atu kia koe Dean me Garry raua ko te Whiting whanau. Here is a very small but significant part that Cliff generously gave to the many voices in the 1988 HeartlaNZ documentary I made… There is much more in his interview at the Film Archive. Janet Davidson as well as Cliff, Te Aue Davis, David HIggins, Dame Whina Cooper. Love it! I will watch it all properly on the weekend! Kia ora Ann, sincere apologies, yes Mervyn Taylor, not Melvyn Talyor, that was a typing error. Thanks for letting me know of the mistake. I have fixed that now. Where’s the acccompanying image of Kauaetangohia Marae?